Diversified by different terrains, cultures, languages and lifestyles yet united by its heritage and believes, India is non like other. With more than 6 types of practicing religions, this land has23 constitutionally recognized official languages, consequently myriads of cultural colours. This country is a surprise packet for any traveler. The diversity of this place offers ample to any traveler’s interest. From wildlife to heritage, from food to festivals and more, the land is INCREDIBLE!Travelers have found this part of world intoxicating and overwhelming. Taking into account the interest of modern day global travelers, Max Holidays has meticulously planned this 18 days Incredible India Tour to explore this country across its length & breadth. Unlike other itineraries, this tour starts with a fabulous relaxation & rejuvenation note. 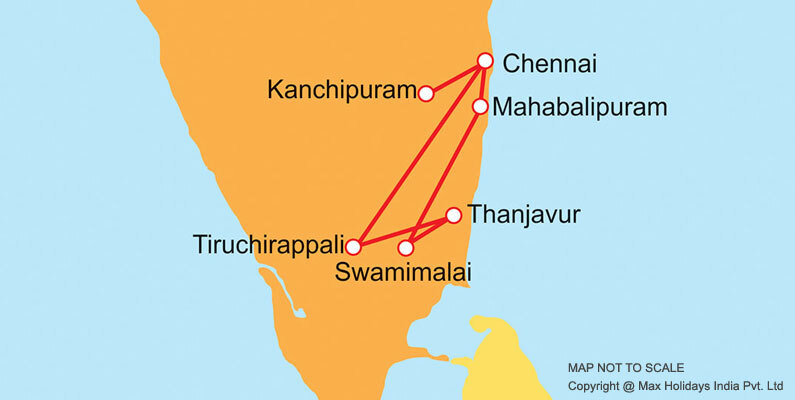 First destination being Cochin (Kerala: Sothern most state of India) and the last destination Delhi (The capital of India) travelers experience the true colours of India. Your Incredible India journey starts on arrival at Cochin airport; with a warm welcome leading to a comfortable stay, local sightseeing and more. This is carried ahead with a fascinating drive to Munnar, the next day. As your tour progresses you will be visiting Periyar, Kumarakom, and Alleppey in Kerala. After Kerala, it is Mumbai, the commercial capital of India. An amalgamation of modern life and age old culture & heritage, Wales Museum, Victoria Terminus, Crawford Market,Elephanta Cavesand more to see in & around Mumbai. Royal Jaipur will be your next destination. The richness of royal culture, the exuberance and the grandeur all in a platter for you. Ranthambhoreis on list after Jaipur. Enjoy the natural habitat and the safari. After the backwaters, tigers, and royal reminisce, it’s time to explore the remains ofMughal era and their influence on Indian culture at Agra covering Taj Mahal, Fatehpur Sikri, Agra fort and more. The next destination is Khajuraho via Orchha. These places will take you through the old-world charm of Indian heritage. Further on itinerary, it is the oldest temple city, Varanasi. Your visit to the Ghats where river Ganges – the holy river of India flows, will be enchanting. It is time for the Capital of India– Delhi, towards the end of your Indian sojourn. This place is a hub that beholds different culture, heritage, modern lifestyle and more. When at the heart of India, Delhi, you can enjoy a sightseeing tour and visit the most prominent sites of interest. Our team will bid you a goodbye from Delhi as you board your respective flights with enchanting & exhilarating memories of Incredible India. Upon arrival at Cochin airport you will be transferred to a pre booked hotel. Rest for sometime in the hotel and then proceed for a sightseeing trip visiting Fort Cochin - Ancient capital of the Dutch, Portuguese and finally the British, Mattancherry Palace, Jewish Synagogue, Dutch Palace and Church of St. Francis where the mortal remains of Vasco Da Gama was buried before it was shifted to Portugal. In the evening enjoy watching Kathakali Dance Show. A famous dance form performed by local artists showcasing the rich culture, tradition and heritage of Kerala. If you wish to see the pre performance preparation and make-up of the artists reach at the theatre by 5 PM. After breakfast in the hotel drive to Munnar & check – in to the hotel. Later proceed to discover Kerala tour where you will take a fascinating journey to the beautiful hills of Munnar. The drive to Munnar is full of some stunning views of the Cardamom hills & green tea plantations. On arrival at Munnar check into the hotel and spend rest of the time in relaxing or doing some trekking around the tea estate of Munnar. Overnight stay in the hotel. After breakfast drive to Muttupetty. Visit the Mattupetty Dam, Dairy Farm, Shooting point, Kundale Lake and Echo point. Evening free and night stay at the hotel in Munnar. This morning after an early breakfast drive to Periyar (Thekkady). On reaching Thekkady Upon arrival check in to the jungle resort. After some rest visit Periyar Wildlife Sanctuary which is one of the most fascinating natural wildlife reserves in India under ‘Project Tiger’. The geo-morphological diversity of wildlife and scenic beauty at Thekkady invites travellers from all over the world. The man-made lake of Periyar add charm to the wildlife park. One can take a trekking trip inside the jungle to witness the rich flora and fauna of Thekkady. 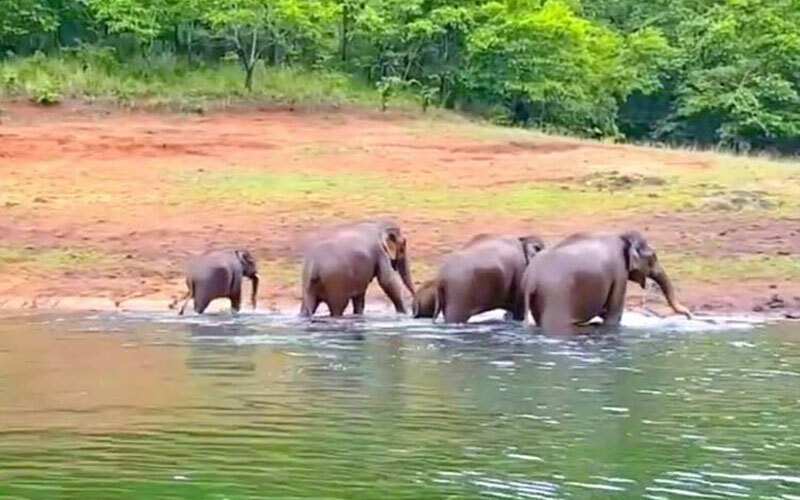 The large herds of wild elephants can be seen near the lake which remains the prime attraction of the Periyar . Overnight at the hotel. Head to the beautiful backwater land of Kumarakom. The sleepy little village on Vembanad Lake, Kumarakom is known as the motherland of Kerala backwaters. Kumarakom is a beautiful destination with wide variety of exotic sites, boating and fishing experience.On reaching Kumarakom check into your resort and then take a tour to Kumarakom Bird Sanctuary. After lavish breakfast spend some relaxed time at your resort witnessing the natural beauty of Kumarakom. Later take a drive to the backwater deck to board the beautiful eco friendly houseboat of Kerala backwaters. 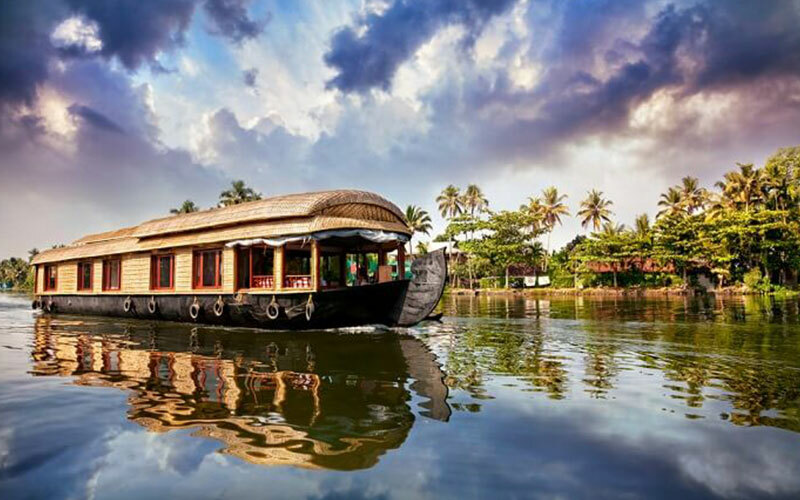 This is the most awaited moment of the tour as you embark your Kerala Houseboat Tour (Kettuvallam). Enjoy watching the scenic beauty of Kerala Backwaters and green lands of Kerala from your floating villa. 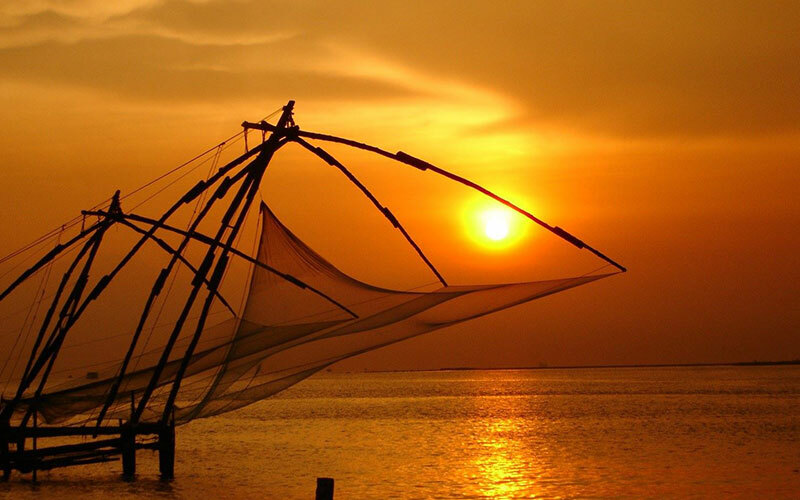 In the evening during your Kerala backwater tour you will also enjoy the sunset from your luxury houseboat of Kerala (the sunset view from a houseboat is believed to be one of the best scenic view in Kerala Backwaters). All meals, tea/coffee will be served to you on board your Kerala Houseboat cruise tour as you continue your journey to Alleppey. Early morning after breakfast disembark at Allepey and transfer to Cochin airport to board flight to Mumbai. At Mumbai airport our executive would receive you and transfer you to the hotel. Later enjoy sightseeing trip of Mumbai visiting the Prince of Wales Museum, High Court Building, Victoria Terminus, Crawford Market, a drive past the Marine drive and Chowpati Beach and conclude the tour by a visit to Mani Bhavan, a small museum which was Mahatma Gandhi's residence in Mumbai for 14 years. Overnight stay in the Hotel. After breakfast visit Gateway of India spend some time here and then enjoy cruise to Elephanta Island. One hour boat trip brings you to the Island which can be explored by walk. 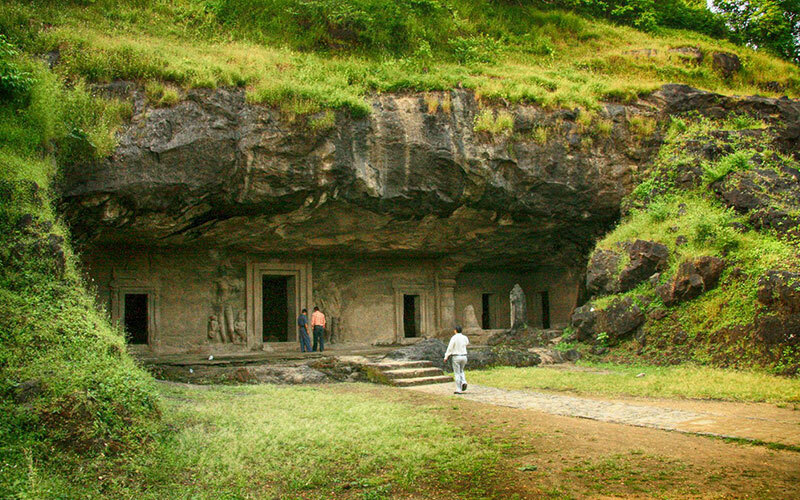 The famous 7th century rock cut caves of Elephanta are classified ‘UNESCO World Heritage Site’. The celebrated Hindu cave temple on the island is excavated from a cliff high above the water and is approached by long flight of steps. Carved during the Golden age of Gupta Dynasty these temples have been inspired by the worship of Shiva. After completing the tour of Elephanta Island return to Mumbai and take a trip to Dhobi Ghat (huge outdoor laundry of Mumbai). It is estimated that nearly half a million clothes are sent everyday for washing and ironing. Later return to your hotel for stay. 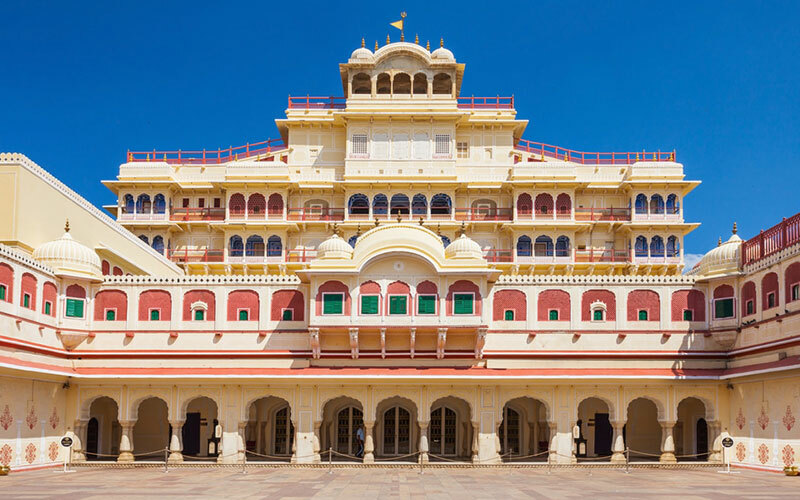 Spend leisurely morning in your hotel and after breakfast transfer to the airport to board flight to Jaipur which is the capital city for the royal state of Rajasthan in North India. On reaching Jaipur airport get assisted transfer to your hotel and then start sightseeing tour of the ‘Pink City’. Jaipur is often referred as pink city due to its pink coloured markets, houses and buildings all around in the old city. Visit Hawa Mahal – Palace of Winds, The largest observatory of Jantar Mantar and City Palace Museum which still houses the royal family of Jaipur. In the evening get impressed with the soul inspiring experience of watching the local folk dances performed by the local artists. Followed by the entertainment we have special dinner arranged in the city restaurant. Get up and be ready for a royal experience of travelling to Amer Fort on an Elephant’s back like a king. After breakfast drive to the fort and park the vehicle at the foothill from where the elephant will take us to the top of the hill. On reaching the fort have an Arial view of the Jaipur city from the top of the hill and explore the beautifully designed and crafted gates, halls, lawns and courtyards. Proceed to Jaigarh fort where one can see the largest canon of the world displayed for the visitors. After visiting the forts and palaces of Jaipur spend some free time in the colourful bazaars of Jaipur for a real local experience. Rest of the time free and night stay at the hotel. Make your way to the land of Tigers. Drive to Ranthambore National Park today which is the most famous and the finest tiger reserves in Rajasthan, North India. The main attraction of the park is jungle games for spotting Royal Bengal Tiger, Leopard, Wild Boar, Stripped Hyenas, Chinkara, Langur in there natural habitats. Ranthambore Park also offers over 300 species of beautiful birds which makes it a perfect destination for bird watchers also. Enjoy afternoon safari inside the jungle in a jungle vehicle with naturalist and stay at your resort for the night. Morning and afternoon jungle games in Ranthambore Park. One can also pay a visit to Ranthambore Fort if interest. Leisurely stay at hotel. Early breakfast in the hotel and drive to Agra in your private car. Make yourself convenient to stop at fatehpur Sikri which is situated 30 kms before Agra. This beautiful walled city of Mughal (now deserted) was built by Akbar to commemorate the birth of his son Salim (later Jahangir). Mughals used this city as thier capital for about 14 years and then shifted to Agra due to acute shortage of water near Fatehpur Sikri. After visiting the ghost city drive to Agra and check in at your hotel. Later enjoy visit to Agra Fort and the most beautiful monument of Taj Mahal which is situated on the bank of river Yamuna. 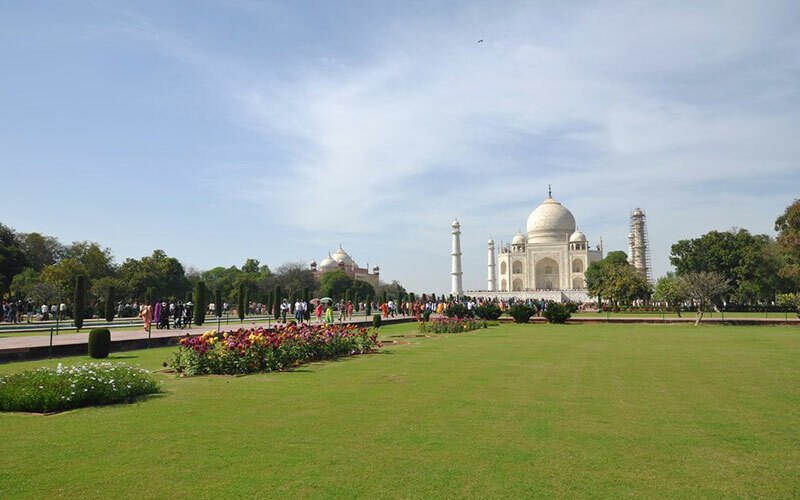 A Tonga ride from Shilpgram to the entry gate of Taj Mahal will add charm to the visit. After breakfast transfer to the railway station where we experience the journey in one of the Superfast trains of India. Reach Jhansi at around 1100 hrs. We will drive from Jhansi to Khajuraho enroute visiting Orchha famous due to its temples and forts. 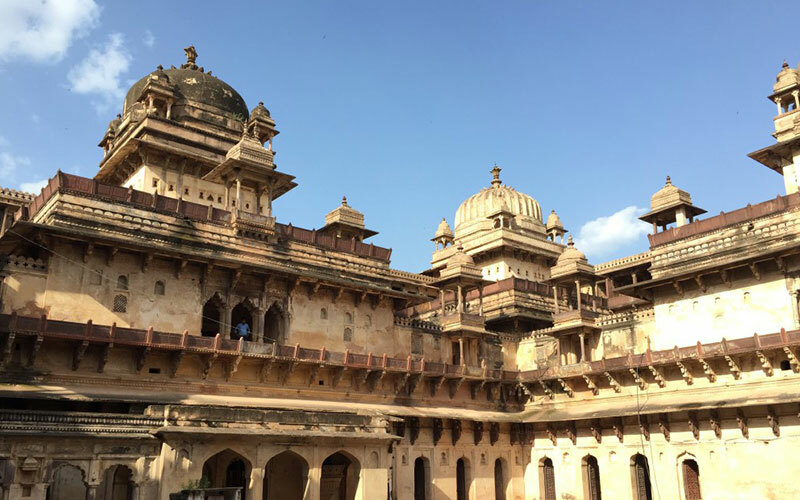 Visit Orchha Fort and Temple name Ramji Mandir, Raj Mandir and the Jahangir Mahal. Continue to Khajuraho. Late afternoon visit the temples of Khajuraho, the temples were built during the Chandela dynasty fall into three distinct groups and belong to two distinct religion Hinduism and Jainism. In the evening witness live ‘Light & Sound Show’ at the temple complex. Night stay at the hotel. After morning breakfast visit the rest of the temples and transfer to airport to fly to Varanasi. Upon arrival in Varanasi transfer to the hotel. Afternoon take an excursion trip to famous Buddhist site of Sarnath. It is where Buddha visited after attaining enlightenment at Bodhgaya. Visit the Stupa, Temples and Ashoka Pillar. In the evening visit the ‘ghat’ (water front) of holy river Ganges where the world famous ‘Ganga Arti’ (evening prayer ceremony) takes place daily. Participating in this magnificent event will be one of the lifetime experiences for you as the ritual makes every moment filled with spiritual thoughts. In the morning during sunrise, pay a visit to Ganga again. Reach the Dashaswamedh ghat to board your private boat for an hour ride through various ghats. Witness the early morning offerings on the bank of the river to have a real feel of the lifestyle of locals living in this oldest city. I 4 kms boat trip will make you surprised when you people praying, cremating the bodies, washing their cloths, taking bath and performing other daily activities on the bank of the holy river. Disembark from your boat at Manikarnika Ghat and walk through the narrow streets to reach your vehicle. The streets are dotted with many temples, old houses and shops. Come back to your hotel and have leisurely breakfast. Later take a sightseeing tour of Varanasi city visiting Durga Temple, Kashi Vishwanath temple (Golden Temple), Annapurna Temple and other important sites nearby. Take a drive through the world renowned Benares Hindu University (BHU) while driving back to your hotel. Spend leisurely time on your own and night stay will be in the hotel. Remarks : One can experience to travel in an overnight sleeping class air conditioned tourist train from Varanasi to Delhi, if interest. If you are travelling in a night train to Delhi you will reach in the morning and you will be transferred to your hotel. If not then airport transfers in Varanasi and Delhi will be organised as per the flight timings. Later enjoy a sightseeing tour of Delhi visiting the most prominent sites of interest including Jama Masjid (the largest mosque in India), Chandni Chowk (the age old market place of Mughals era), drive past the Red Fort, visit Raj Ghat (The cremation ground of Mahatma Gandhi). As you continue drive through the beautiful part of Delhi dating back to British Raj you see the beautiful architecture of India Gate, President’s Palace and Parliament buildings. Since this is a VVIP area parking your vehicle may be a problem here, hence ask the driver and guide to make it convenient for you to get off the car and click some beautiful pictures. If time permits, also visit Qutab Minar and Humayun’s Tomb. Night stay in your comfortable hotel. In time you will be transferred to the airport from where you board your flight to home or onward destination. Breakfast is complimentary today and if you are leaving in the afternoon, enjoy your tasty breakfast in the hotel restaurant before leaving the hotel.